Miley Cyrus is wearing silver thigh-high boots. A high belt supports a loincloth of chains and cascading crystals. Gleaming leather straps streak across her breasts, inviting imminent wardrobe malfunction. Nicki Minaj sports a sheer, embroidered gown with a mermaid tail and a neckline that plunges to the belly-button. Justin Bieber shows off in skintight, distressed jeans, rough-out boots, and a black leather jacket—rather like something Bruce Springsteen might have worn in his glory days. Millions of viewers around the globe tune into the Video Music Awards to gorge themselves on glamor, glitz, and gossip. But the students gathered around the conference table today are not here for entertainment. They are taking Theatre 220, History of Clothing in Society and Performance, and they have come to deconstruct the fashions on display at the award show. Students deconstruct Britney Spears’s outfit at a glitzy glamor event. “An apron with straps,” comes the reply. “It reminded me of suspenders, or lederhosen,” says another. It’s something of a paradox. Outfits like the ones on display at the VMA show are designed to grab attention, but fashion in general has not traditionally attracted the same kind of attention that scholars have paid to theatre, art, or literature. This is a shame, according to Chapin. Clothing, she argues, represents an extraordinarily rich field of study, weaving together a fascinating tapestry of history, economics, politics, anthropology, and art. Clothing may conceal, but it can also reveal how people in various eras and cultures have chosen to project elements of their identity. Prof. Chapin looks at the evolution of hairstyles and the tuxedo for insight into deeper historical forces. Professor, artist, costume designer, and fashion historian, Chapin has designed for theater, opera, and dance. She has a BFA in performance production from Cornish College of the Arts, an MFA in Costume Design from the Yale School of Drama, and an MA in Fashion and Textile Studies from the Fashion Institute of Technology. She taught fashion history at FIT for nine years, and has lectured at Yale, NYU, Barnard, and Stockholm University. 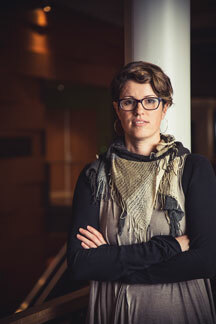 She was a 2012 MacDowell Fellow and a 2014 Fulbright Scholar. She was interviewed for a recent Freakonomics episode about why suspenders went out of style. She has also taught several classes at Paideia, including one on the history of hairstyles and another on James Bond and the tuxedo. The professor’s tailored trousers and blazer reflect her interest in the history of men’s suits. Her hair was cut by the barber who advised hairdressers on Boardwalk Empire how to capture the look of a man’s haircut from the early 1920s. 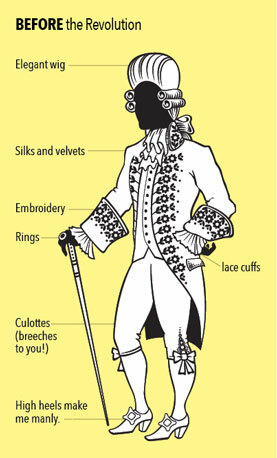 The French Revolution gave rise to a dramatic transformation in men’s fashion known as the Great Masculine Renunciation. 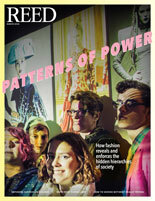 They also ask how fashion reveals—and sometimes reinforces—patterns of power in society. Take, for example, the Great Masculine Renunciation, a tectonic shift in the presentation of menswear following the American and French Revolutions. Before the 1790s, men in Europe typically dressed with the same goals as women. Power dressing was all about ostentation, draping the body with extravagant silks, velvets, and embroidery. Men wore perfume, powdered wigs, high heels, lace cuffs, and jewelry. Picture the Sun King and his court at Versailles. 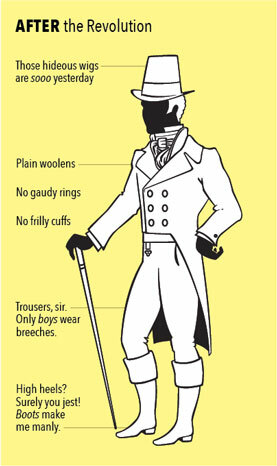 But after the French Revolution, aristocratic finery was suddenly seen as horribly outdated. The culottes (knee breeches) of the royal court became such a powerful symbol of the despised ancien régime that working-class partisans of the Revolution were known as the sansculottes (without breeches) because they wore trousers. Menswear became more practical. Instead of dressing like peacocks, men began to adopt sober woolens in shades of black, brown, gray, and blue. Boots replaced embroidered heels. To ask, “Why did this happen?” is to plunge headlong into the theory of fashion, prompting discussion about the rise of humanism and neoclassicism, the shift from palace living to urban life, and the Anglomania that seized the Continent after the French Revolution. It also invites comparison with contemporary ideas about masculinity, male fashion, and the presentation of self. While people typically use decades—the ’60s, the ’80s—as a kind of shorthand to refer to fashion trends, Chapin points out that the trends that later become “iconic” often aren’t popular until halfway through the decade. Bell-bottom jeans and tie-dyed shirts, for example, the mainstays of any back-to-the-’60s party, didn’t catch on until 1966 or so. One hallmark of a Reed education is the ability to transcend intellectual disciplines; to take insights from psychology and apply them to King Lear, or use dance steps to explain Brownian motion. That philosophy certainly applies to the theatre department, which offers courses on improvisation, race and identity, and performance and activism in South Africa, in addition to more traditional courses like acting, directing, playwriting, and dramaturgy. During one classroom exercise, Chapin asks the students to work as a group, placing 18 fashion silhouettes in chronological order. The puzzle prompts a discussion about the evolution of the bustle until all the pieces are correctly placed but one, an errant silhouette resembling Little Bo Peep, from the 1830s. 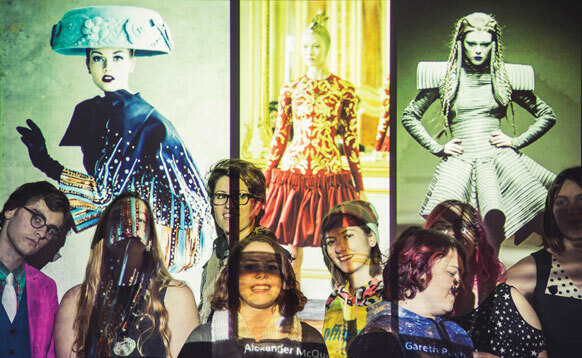 Every student works on a final project that relates to fashion and its subcultures. One student takes on the iconography of pizza. Another covers non-binary-gendered fashion, while a third delves into the emerging “Health Goth” trend. (Yes, this is a thing. Look it up.) These projects give students practice in synthesizing huge amounts of information into a coherent narrative. They also sharpen the students’ ability to separate historical fact from media hype. In the final weeks of the class, the study turns to the 20th century, when the individuals who designed clothes often overshadowed the people who wore them. Students prepare presentations on specific designers, illustrating how their work continues to influence fashion today. Having entered the sixth year of the ought-teens, it is interesting to ponder; will this year’s fashions be what people later remember about this decade? Ombréd hair and sleeve tattoos? Or has the internet accelerated the pace of what’s hot and what’s not so dramatically that categorizing fashion by decade no longer makes sense? Back in class, the screen displays a photo of a bronzed Britney Spears at the Video Music Awards clad in a shimmering skintight minidress spangled with gold and silver sequins, her hair pulled high. The students issue a collective groan. And the discussion begins in earnest. Learn more about the theatre department.